All participating kids get to wear the latest in stylish protective foam head gear, so there’s another reason to rent the Wrecking Ball. The Wrecking Ball itself is made of a heavy foam. Yeah, I know. We were disappointed too. Evidently solid steel is too dangerous according to the manufacturer. After we tried it out though, we quickly realized that it was probably more fun that way. 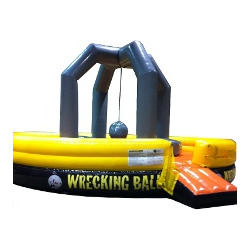 The Wrecking Ball is one of the newest interactive inflatables on the market. It’s just another reason to love us over here at Fun Makers. We’re always trying to make your party or event more fun than it was the last time.